A friend found this wooden box of doll house furniture and dolls in her family’s stuff and gave it to me. I don’t know where they came from or how old they are, but I’m guessing they are northern European, possibly German, from about 100 years ago. It looks like a coffin inside, with padded satin cushioning the furniture and doll bodies. 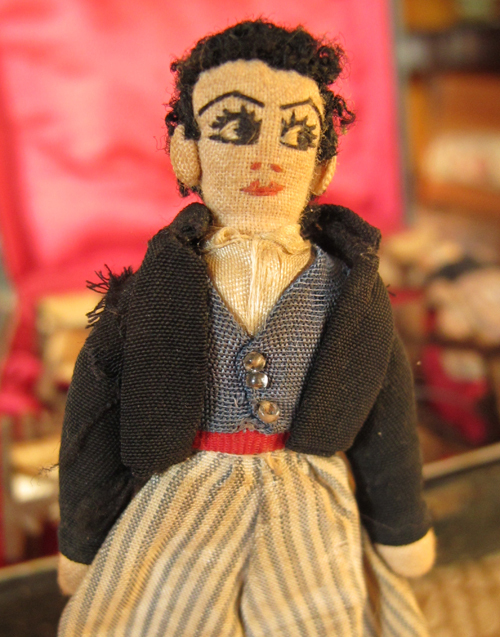 The dolls are about 3 1/2 inches tall. The woman’s hour-glass figure makes me think these were made in the age of corsets. I like the man’s baggy pantaloons and formal shirt and jacket. 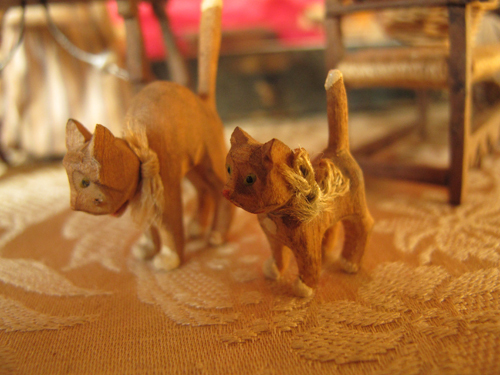 There are 3 little carved cats. The dolls’ eyes seem too cutesy compared to everything else in the box. Maybe they are Betty Boop’s grandparents! 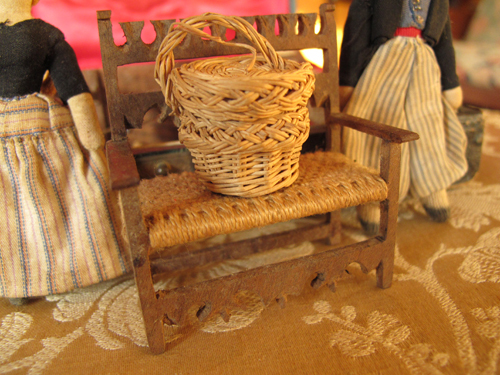 The miniature basket and woven chair seats are perfectly made. 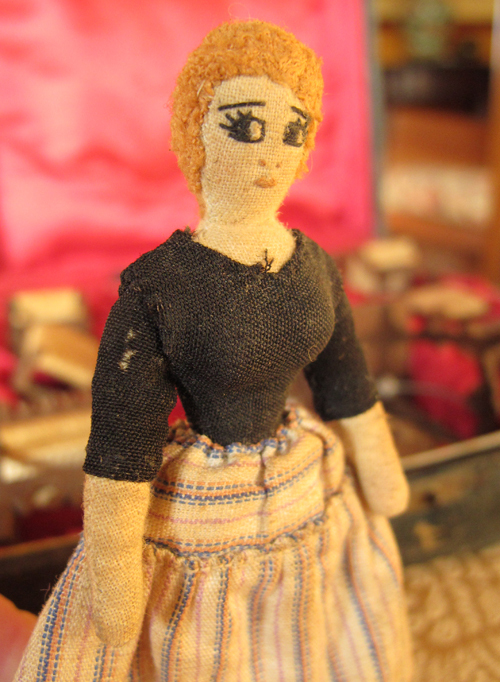 This entry was posted in Doll Collection, Dolls, Treasures by Salley Mavor. Bookmark the permalink. This is just spectacular! It is a “presentation box” but I think the dolls might not be original to the box. The furniture has a Biedermeier feel to it. Perhaps there was more furniture in it. The dolls look like 4 inch Edith Ackley pattern doll house dolls that I make and collect. Are they around 4-4 1/2 inches tall? Faces were open to interpretation but those “red thread noses” are typical of how people made them. The dolls made have been added at a later date. 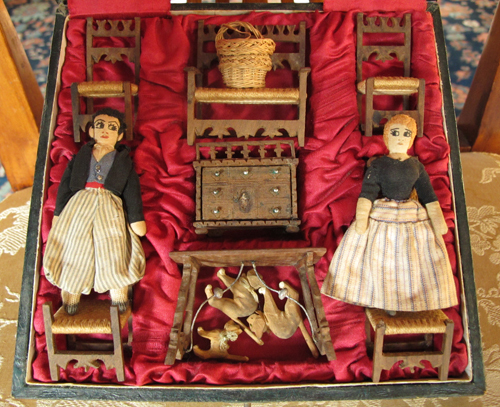 The dolls are crude compared to the wonderfully made furniture! Thanks for all of this info, Helen. 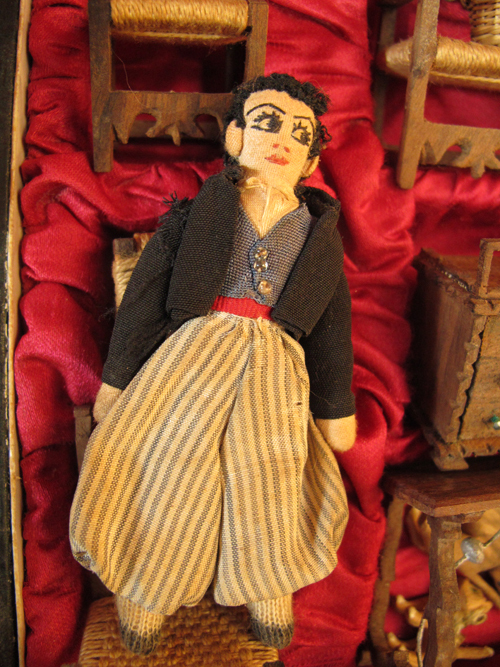 The dolls are little smaller than you describe, 3 1/2 inches tall. I’ve just updated with this. Lovely present. Love the chair and especially the little cats. Truly a treasure, especially the cats! What a generous gift! The chairs are just perfect replicas of the real thing, so charming. Enjoy! What a wonderful treasure! I love the dolls’ expressions and all the detail. How lucky you are to receive such a gift. swoon! what a find – how wonderful they were given to you. i’m not sure i have ever seen anything quite so special. love the man dolls eyeliner! What an absolute treasure!! I love the man’s ears! Your friend is so generous to part with these – what a treasure! 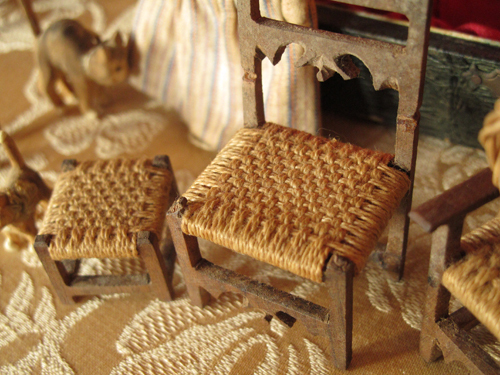 The woven-seat chairs and basket and carved cats are amazing and the furniture so detailed. The woman definitely appears to be corseted LOL! These days you would pay someone a fortune to make a similar contemporary set – I am guessing that was not the case when they were new. The furniture is amazing. So intricately made. Salley, what are you going to do with this ‘gift’? It begs for a ‘home’ with your creations. I’m glad you got this Salley as you will appreciate it. The chair seat is amazing as all the other pieces, never have seen anything like that !! I’m charmed by the way the dolls’ eyes seem to be looking longingly across the box at each other. WOW! You are so lucky, Salley, to have been given this wonderful, wonderful gift. I, too, am so happy that your friend gave it to a person such as yourself, who will treasure each and every piece. 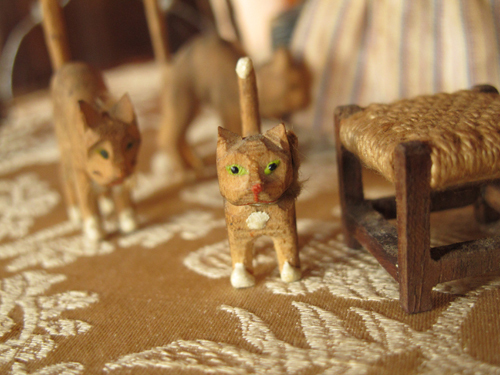 Fantastic – the furniture, dolls and cats are all lovely, and very skilfully done – and then the box! They were obviously greatly treasured. I’m not an expert on either German or American dolls house furniture, but American companies like Cass and the Star Novelty Co did produce similarly intricate wooden furniture. I haven’t seen any quite like this, though, with the woven chair seats. I hope someone recognises them! WOW! Such a treasure to behold…and it looks like everything is in mint condition. The chairs look especially interesting and pristine. I know that you will be a loving caretaker of these items, and will use them in your future projects perhaps?! Thanks for sharing again. What a treasure and what a treasured friend. Try to find as much as you can from her friend about her family now while it’s still fresh even if she doesn’t know the exact provenance. Thanks so much for the photographs. What a splendid and charming set! 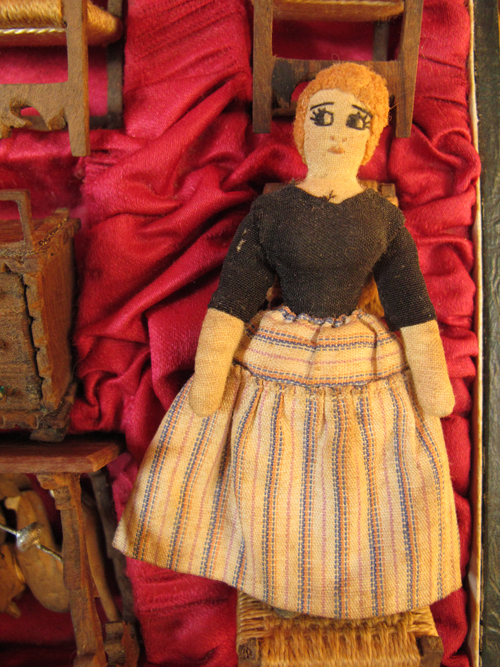 I’ve collected antique dolls for many years and especially like the so-called “Presentation” boxes, but have never seen one even similar to this one. I agree with others in that the dolls do appear to have been added? I dunno… but, whatever, I do know this… the set couldn’t have ended up in a better forever home!! !